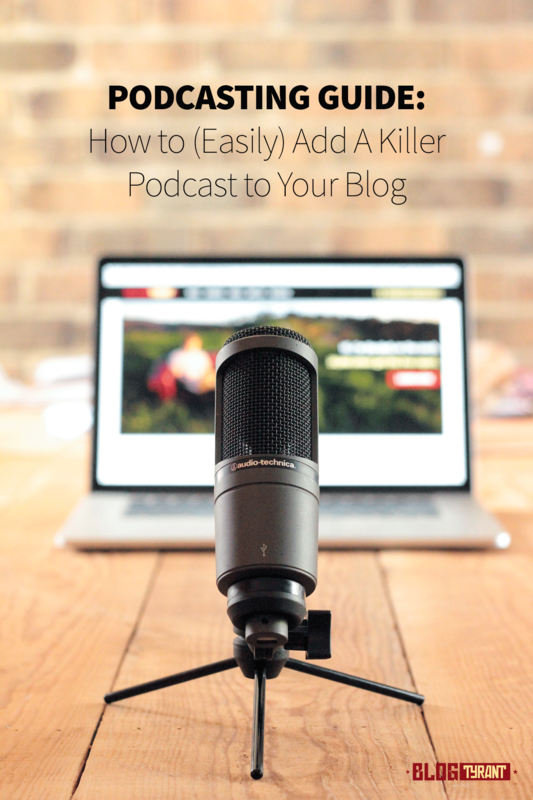 So, you want to learn how to add a podcast to your blog? Here’s a 3,000-word guide that might help with that. Podcasting is now serious business and, for many bloggers, the traffic from search engines like iTunes is catching up to the likes of Google. Supplementing your regular written content with an audio podcast show can be a very smart idea. The problem is that setting up a podcast is a confusing process and can take a really long time if you’re new to this type of thing. In this post I’ll go through all the steps you need to set up a podcast from your blog as quickly as possible. Hopefully this will save some people some time and frustration. The content below is going to go into all the detail for the points above. As mentioned, it can be a bit of a nightmare so make sure you follow closely. As we say a lot here on Blog Tyrant – don’t worry about getting it perfect. Let’s just get it started! Before you go down this path it’s important to establish whether or not your blog is both technologically suitable and creatively suitable for hosting it’s own podcast show. While a lot of people reading this will have their blog on a free provider, I highly recommend using a self-hosted WordPress blog with your own domain name. The reason this is relevant for podcasting is because the plugins that are available for WordPress users make the process much, much simpler as well as giving you control over things like feeds, artwork, content delivery, and much more. It has always been my opinion that if you are going to start a blog or podcast and work on it like a business then you should treat it like a business in all forms. Part of that means having a set up that you fully own and control, while at the same time giving you the best power and flexibility. For this reason the rest of this tutorial will be based around setting up your podcast on a WordPress blog. I’m still convinced this is the best way. The next thing I wanted to mention before diving into the main set up process is that it’s important to have a really solid idea for your podcast that will both help people and sustain a topic for a good length of time. If you take a look at 90% of the most popular podcasts you’ll notice that they all try to make the world a better place, and they all do that in their own little way. This American Life, for example, regularly looks at issues facing ordinary Americans and presents solutions and outcomes that might help listeners. NPR Politics does the same thing in the political arena. So, before you start out on your podcasting journey I encourage you to make sure you have a really clear concept about who you are trying to help, and how you are going to do that. Think about the format of the show, the guests you might have, the problems you might address, and really try to find interesting ways to solve the problems in your niche. Once you’ve done that, you’re ready to start installing stuff! Oh, and here’s my attempt. What microphone is best for recording a podcast? What about the software I need to save the files? These two questions are usually the first things bloggers ask about podcasting. As you can imagine, the options in this area are almost limitless and as such we need to just go over a few good and reliable products that are good quality and not too expensive. That way we avoid extensive and crippling research that can take days or even weeks. The good news is, you don’t need to spend thousands of dollars to get a decent set up. Especially in the early days, it’s entirely unnecessary to go overboard on the budget. A very basic podcasting set up with USB mic, lapel mic, laptop, and an old carpet. My own podcasting is done with a simple Audio-technica USB mic that I bought on Amazon and my laptop. And while the sound is not at NPR quality, it is more than enough for my needs and the needs of most beginners. A lot of bloggers start off with the Blue Yeti which will set you back about $100 and puts out decent quality sound. Cheaper microphones like these have advantages and drawbacks. For example, mine records lovely sound quality but will pick up anything within 20 feet as loud as if it’s right next to the unit. In the past I’ve had to switch the fridge off to record! Sound recording can be a really complicated and technical so it’s best to start off with something good but not perfect and slowly work at getting more professional if and when your podcast becomes more popular. Check for good reviews and make sure it is the type of mic that plugs in to your laptop. What recording software should I use? The next step is to get a program that allows you to record and edit your podcast episodes. Inside Audacity. The bottom line is an intro file, the top is the episode. When it comes to sound recording you’re going to face a little bit of a learning curve, sort of like when you first started a blog. There’s lots of new buttons and sometimes you have no idea what’s going on. If you have a newer Mac or PC you probably have some inbuilt software that will allow you to record a podcast pretty easily. My preference, however, is a free and open-source program called Audacity that is designed to very simply record, edit and save sound files. My main tip here would be to not pay for any software and instead play around with the podcast recorder on your computer and then download Audacity and see which one you prefer. Again, it’s not necessary to spend money here. The next step is to set up your podcast at the back-end level of your blog. Unfortunately, this is where it can get a little big confusing. Essentially a podcast is just a sound file (like an MP3) embedded in a blog post. That blog post is then part of a feed that is picked up by iTunes so that people can be notified of new episodes on their smartphones. What we are doing at this stage is installing a plugin that neatly sends iTunes all of that information automatically. If it sounds confusing don’t worry too much. All you really need to know right now is that you don’t actually upload your sounds files to iTunes directly but rather create a place/function on your blog so that iTunes knows where to find your podcast episodes. The first step is to download the Blubrry PowerPress podcasting plugin and install it on your blog. You can do this by logging into your WordPress blog and going PLUGINS > ADD NEW and then using the search function. One of the pages inside Powerpress that allows you to create a podcast from your blog. Once you’ve installed the plugin you’ll get a choice to use a Simple or Advanced Mode of the plugin. For most bloggers the Simple Mode will be sufficient. The Advanced Mode, however, gives you a few more options and allows you to create separate feeds so that, if you wanted, you could run more than one podcast from your blog. 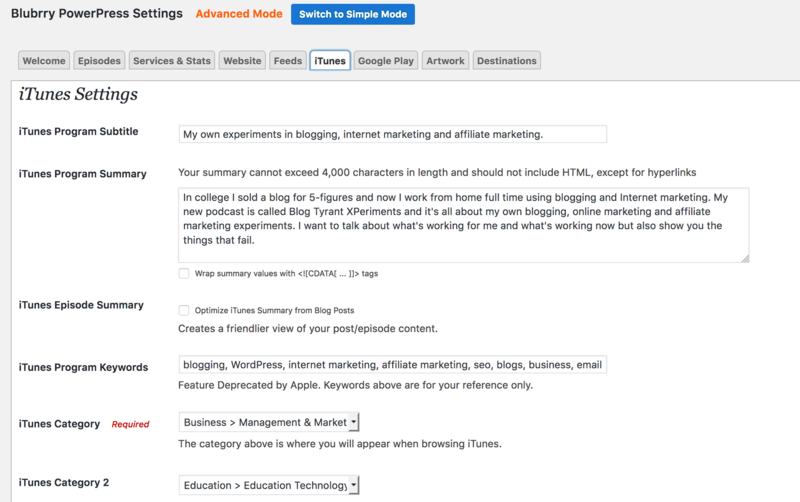 Now, there are dozens of settings to go through here, but the main thing you want to understand is the relationship between your blog’s regular feed, your new podcast feed, and how the plugin lets you configure all of that. I’ve done a short video to cover the main points. Go through and copy what I’ve done in terms of filling out the areas like iTunes show name, description, category, keywords, etc. As I said in the video, this was not meant to be a setting-by-setting walk through but rather a quick overview of how the plugin allows your blog to also publish a podcast. If you get stuck on any settings make sure you check out the set up guides provided by Powerpress. The artwork that goes along with your show is really important. Just like with your blog, standing out from the crowd is vital if you want to cut through the competition and get some traction. The way you create your show art and the styles and elements you choose will have a huge impact. 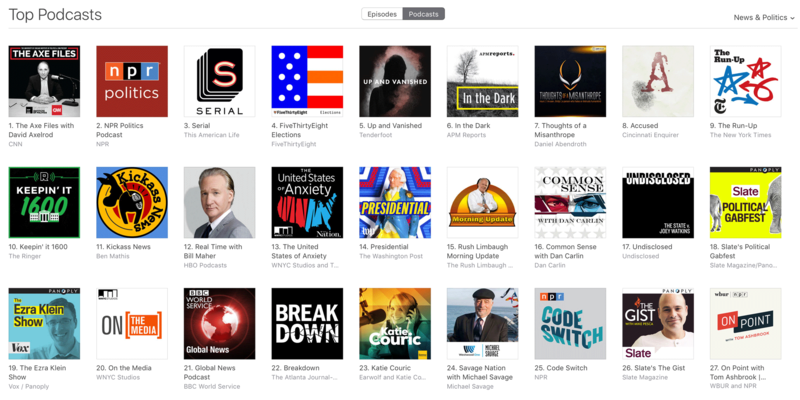 The current top podcasts in the News and Politics section. Which one stands out most for you? Have a look at the top shows for the News and Politics section and you’ll see an interesting mix of faces and graphics with no faces but large, heavy text and colors. If you already have a well known brand it can be a good idea to make that the main feature. If not, a lot of studies have shown that people respond better to human faces then graphics. Your image needs to be 3000 pixels x 3000 pixels in order to account for retina display screens while still being visible at smaller sizes. Once you’ve created the artwork, upload it to your blog and then add it to the “Artwork” section within the Powerpress plugin as shown in the video above. 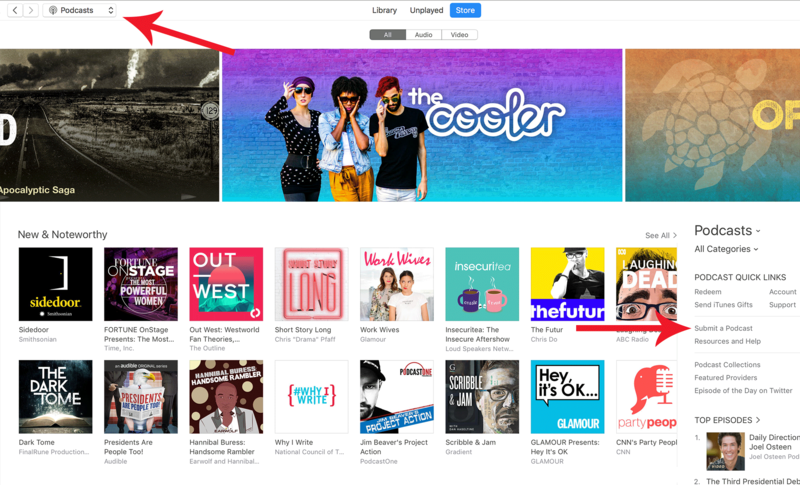 Before you can submit your podcast to iTunes you need that podcast feed to become active. And for that to happen you need to publish your first episode. There are a few tricky steps in this section but, once you’re done, you’ll find the whole thing is easier because the main set up stages are done forever and from here on in you just have to create content. Prepare for recording by making notes on your content talking points and setting yourself up in a quiet room with no distractions. Turn off your phone and make sure you don’t have any computer notifications that might pop up on the screen or make a bing. Once you’re ready, open up Audacity and test your microphone settings. You can record a few 10 second clips and play them back to yourself to see whether the volume and quality is set nicely. If you run into any problems check out Audacity’s user guide for ideas. The next thing you need to do is record your episode and add any introductions or music that you might have. You do that by simply going FILE > IMPORT and dragging it to the place you want it on the audio. Once finished, hit FILE > EXPORT and then you’ll see a screen like the one above that asks you to fill out details. It’s important that you get these right as it will affect how your file displays in some formats. I’ve put some notes on the image above. Now your MP3 episode will be saved to your computer somewhere and is ready for uploading. If you like, you can listen to it on your desktop to check for any errors. The next step (we’re almost done!) is to upload that file to an MP3/podcasting service like Libsyn. As mentioned above, you don’t want to host these audio files on your blog because you could run into bandwidth issues if you get a lot of downloads. That’s the type of thing that causes your site to crash. Libsyn is a great service because they don’t penalize you for getting lots of downloads. Instead of paying for bandwidth you pay for what you upload. For example, for the $15 p/m plan gives you 250MB and you could upload around 2-3 podcasts a month. Once you’ve chosen your plan, go to CONTENT > ADD FILE FOR DOWNLOAD ONLY > UPLOAD and then hit PUBLISH once you’ve selected your first episode MP3 file. That will load for a while and then give you a URL of your MP3’s location online. We’re going to need that URL in a minute so leave that page open and/or copy the link. Now you need to head over to your blog and go to POSTS > ADD NEW and fill out the headline and body text. Your headline will be the title of this Podcast episode, and your body text will describe what the episode is about as well as including the player and podcasting shortcode. 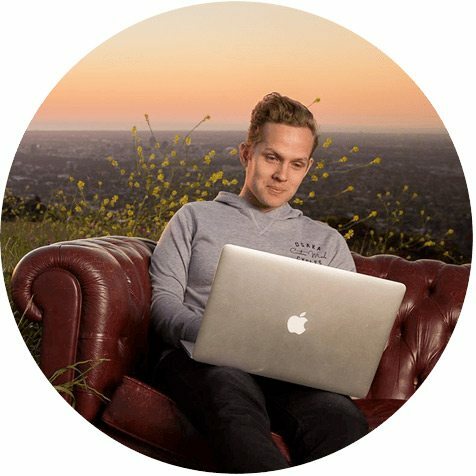 If you’re not sure what to include in these posts just have a look at what other bloggers like Tim Ferriss do. Once you’ve done that, go ahead and paste that Libsyn URL from before into the section called Podcast Episode that will appear below your blog post’s content area. Click the Verify URL button as pictured above. Finally, select the Podcast category, give it some tags and then when you’re all done hit Publish. You’ve now published your first podcast episode! By this stage your podcast is live on your blog and all of your readers will be able to listen to it directly from the Powerpress button that appears in the blog post. But what we really need to do is submit it to the world’s biggest podcasting search engine: iTunes. Submitting a podcast to iTunes for the first time. To do this simply log into iTunes with the account that you want to be the “owner” of that podcast. Think carefully about which iTunes account that should be. Then navigate to the Podcasts section at the top and find Submit a Podcast on the right hand side. This will then take you to a new screen where it asks you some details and, most importantly, your Podcast Feed URL. This is the URL I showed you in the video above and can be found again by logging into your blog and going POWERPRESS > SETTINGS > FEEDS and then copying the podcast feeds URL. Once you’ve submitted that it will take a few hours or even days to show up in iTunes. Once you see it in there have a careful look at all the text and images and make sure it all looks good. If not, track back through the Powerpress plugin settings and make adjustments. Unfortunately, a lot of bloggers write incredible posts and then wonder why no one is visiting. Well, the main reason is because they haven’t done any promotional activities. Podcasting is exactly the same. If you want to make sure that you get people listening you need to spend more time promoting it – more time even than you spend creating them! One of the best ways to get your podcast known is by getting attention from other established podcasters. For example, follow all the top podcasts in your niche and make sure you interact on Twitter when new episodes come out. Help promote them and they might return the favor. Advertising on podcasts is cheap and often very effective. Big shows like RadioLab will be out of reach financially, but there are lots of smaller shows that still have good reach and are looking for advertisers. Keep it in your niche and work with the founder to develop an ad that works. Hopefully if you have a blog you’ve also been building a mailing list and as such you can do a little promotional campaign that might involve some giveaways or a special release date. Don’t be afraid to ask for shares in this situation – if you’ve been providing value people won’t mind. When you first launch your podcast it’s a good idea to ask your friend and family to leave a 5-star review on iTunes. The more reviews you can get in the first few hours the more chance you have of hitting the New and Noteworthy section which can really boost your exposure. Ask nicely and give easy-to-follow instructions. A very successful promotional technique is to align your podcast with things that are going on in the world. For example, a lot of podcasts popped up around the time of the Star Wars movie release and had graphics and names that looked and sounded like Star Wars in some way. These shows get a lot of attention in search engines. For example, if you’ve done any episodes near the election with “Trump” in the title you’ll likely get some love from people searching for answers. One of the big things to remember here is that it’s not likely that your podcast will be a massive smash hit right away. Sometimes it takes months and years of work to build up a loyal audience and get the traction that you were hoping for. It’s also good to remember that sometimes opportunities arise from podacasting even when you don’t have a huge audience. It might just be a new business contact or a collaboration that takes place. So, don’t discount it if you don’t have immediate success. Bloggers, do you have a podcast? This post covered quite a lot of information but also left quite a lot out. I deliberately tried to make it a “broad strokes” type of thing instead of getting into too many details, but I’d love to know if I’ve missed anything really important that might impact someone trying to get started. Please leave a comment below if you have any tips for someone wanting to start a podcast from their blog. I thought I could record through my computer, upload, and embed! This is a lot more involved than I thought. I have a friend who has a channel on BlogTalk Radio. He interviewed me twice through Skype for his show. I didn’t notice any quality problems, but maybe he did something to the recording on the backend. I’ll have to ask him. I’ve had buffering problems with the free version of skype. Not always, but it happens. Thanks, Chris! I have been thinking about producing one, but I only have a WordPress.com site. I would have to embed from another site. What do you use? I think you must be a little psychic Ramsay, I have been thinking seriously about starting a podcast about digital marketing and business in Tasmania/Australia – I think there is a lot of catching up to do for many biz owners here! So yes timely post, and one I will be referring to! Hi Michael. Definitely not psychic but maybe a little bit psycho. Glad it helped! This is a really informative piece and provides lots of value on setting up your show. I’ve just recorded my 65th episode – and one of the greatest things about podcasting once you get everything up and running is the trust and authority you can build even with a modest audience. Not everyone is going to get tens of thousands of visitors for each show (my highest is just over 3,000 for one episode), but while many people feel tempted to give up when they see ‘only’ a few hundred listeners per show – they should keep going because the level of trust and authority you generate with prospects is incredible. In this context my own show has now been responsible for generating multiple high end clients over the last few years – so much so that I only really create podcast content now (over text). My podcast listeners are now greater in number than my blog readers – but the leads I create are very targeted. Congratulations. That’s exactly the type of story I was hoping to hear. You don’t need NPR numbers to make it work. I’m a regular listener to your show. Its top notch. I had’t actually thought about doing Podcasting myself, but now it’s definitely something I want to get up and running with in the next few months. Perfect timing… (and thanks for the twitter shoutout). I started to record a podcast a few months ago but then had to put it on hold. Why? Because I thought I knew what my audience wanted…until I decided to poll them at the last minute, after I’d recorded a few episodes (never released). Glad I did. Now I have that to work on. 1. Use Fiverr for Graphics. If you do, be as specific as you can as to what you want. Include colors, link to existing logo, ideas, whatever you can and that will help the designed a ton. I paid a few extra bucks ($40 I think) and got a bunch of extra stuff including the source files and unlimited revision. Also, I worked with the graphic artist with recommendations on their first drafts. Instead of saying “I don’t like that,” I sketched out something with a simple drawing tool – using the mouse, that was close to what they had but more in line with what I wanted. Ended up with a great graphic and the designer said he’d never worked collaboratively like that and it was helpful to him and enjoyable. 2. Use Fiverr for Voice work if you want a custom intro/outro. I paid a total of $25 and got 12. Six variations of each. The area where price makes a big difference is in music/effects. Those cost quite a bit. I’d found a music bed I liked on audiojungle and layered that in myself. 3. Know your recording space. You might have a small quite room to record but if it’s all hard surfaces (walls, desk, ceiling, etc) then you’ll hear echo in your recording. You can avoid this by getting something like the Monoprice 602650 Microphone Isolation Shield that wraps behind your microphone. This way, your voice doesn’t bounce around the room and back into the microphone. Also, the closer you are to the microphone, the better. 4. You can apply a little audio gating via your software in post-production to reduce echo. A gate works by reducing the volume dramatically when the signal drops below a certain level. So, while there might be echo, it’s not as loud as your immediate voice and therefore the gate would drop that echo volume so it wasn’t noticeable. 5. Before starting the podcast, decide how you want to use it to make money. You can eventually get sponsors if you have a large enough audience but for your business, it might be better to send people to your site to buy a product. That being said, I’m seeing site owners drop their podcasts because they weren’t drawing in the extra income. So much of it depends on your market. 6. Lastly, write yourself a script or outline when recording and don’t try to record a perfect podcast every time. For a really bad mistake, edit it out. For little stuff, don’t worry about it. Make a joke and move on. 7. Ok, I have one more….consider the podcast length in relationship to the posting frequency. Have a daily podcast? Go 5 minutes. Have a weekly podcast? Go 20. Monthly? Go an hour. These are more guidelines but might help. 8. How could I forget, don’t assume you know what your audience wants. Send a survey with open ended questions to your newsletter and ask them what they’d want in a podcast and how often they’d expect it be published. Ha! Here’s all your info. Thanks for the tips! Absolutely amazing! That’s why I did the Twitter shout out! Thanks so much for contributing like this. – I like my Blue Yeti microphone. Started with the Blue Snowball and that’s TOO cheap. – We were recording (there are multiple people on it) via Skype. Zencastr is far better for voice over IP recording. – We just host the audio with Blubrry – didn’t see the need to bother with Lysbin? 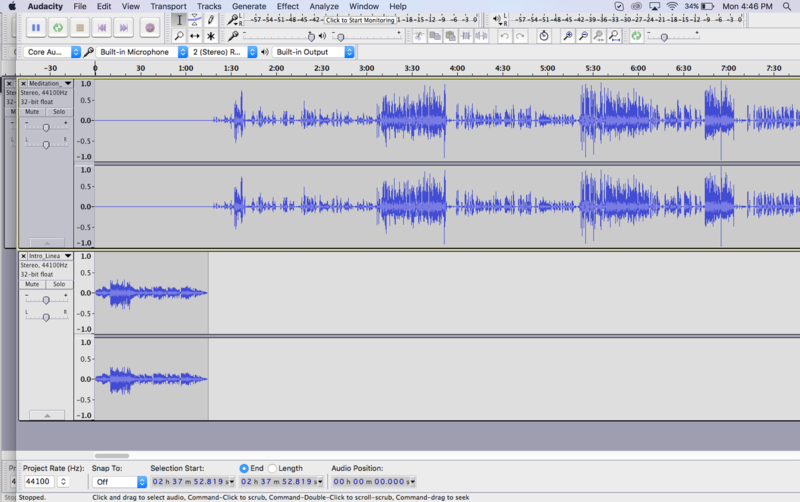 – I edit podcasts in GarageBand – still had a bit of a learning curve but was generally easy enough for what I needed to do. – Postprocessing with Auphonic – you get a few free hours of processing time a month and I’ve never gone over. VERY happy with the results. Hey Alexis. How do you find your hosting in terms of uploads, costs and stats? My media hosting is $12/month (I would have paid $15/month with Lisbyn so roughly the same) . With ~15K downloads a month my blog hosting could probably handle it. I followed the guidelines from Smart Passive Income on setting things up and Pat pointed out that if things take off or somebody big links to you, media downloads can take down a blog and I figured eh…not worth it to me. And I hope that someday my podcast will be big enough to potentially crash my blog server so best host separately now. Because hope springs eternal! To be honest, I don’t listen to podcasts, and neither do I think about creating them. That’s just because it isn’t much popular here in India. I think that the people who listen podcasts are typically US residents who own iPhone and prefer streaming audio while driving. However, the popularity of podcasts has only grown in the past few years, so maybe creating them is a smart move. All big guys are doing it (perhaps, they’re experimenting). But seriously, it’s hard for me to convince myself that podcasts are a nice form of content. I’ve seen a “big guy” recently stop podcasting. If it doesn’t work for your audience, then don’t do it! I suppose that I won’t. I’ve checked out your website in the past. Seriously, you niche is super-unique. I hadn’t seen something like that in the past. The only podcasts which I’ve ever heard were either yours, or that on Viperchill. Not more than a couple of times. Yet, I’m willing to know about the ones you suggest. So, yes. Please let me (and the Tyrant Troops) know about the ones you listen to. I think you would love Reply All, Radio Lab, LORE, and it’s worthwhile listening to things like Serial season one as it was such a cultural phenomenon. Very interesting and I will bookmark this article to come back too in caste I decide to go ahead. I had no idea how much work went into producing these! What would be the main advantage of doing podcasts over videos? What type of audience would you reach that you couldn’t reach on YouTube? About ten years ago, I used to listen to podcasts quite a lot – not so much any more… Is there a podcast revival going on? The main thing about podcasts is that people listen to them in bed, driving, at the gym, etc. It’s so portable. I will sometimes listen to three or four per day! Ramsay, I know a few famous bloggers have jumped on to podcasting and for right reasons because there is a huge audience out there who like to listen rather than read. On the other hand there are people like me who neither listens much nor thinks that in the world of blogging, podcasting is as effective as written words. Would be really useful if you could tell if the engagement matrices such as session duration or comments / shares etc. are significantly, higher, lower or more or less equal between these two main types – written vs. spoken. It’s really a different kind of format and the metrics are also a bit more vague. But, for example, Pay Flynn has now had over 2 million downloads of his podcast, and he often says most of those aren’t people who found it through the blog. So you are tapping into an entirely different audience. My fiancee, for example, listens to podcasts all day at work but will never read a blog post or watch videos. Is a podcast better than a video? I’ve not bothered listening to podcasts, mostly because I’m so easily distracted with nothing to see I lose interest. I wouldn’t say better but it’s totally different, and I suspect a different audience too. See the comment directly above this one. Ramsay, you are all kinds of awesome. I’ve been looking into the whole podcasting thing as well — I totally appreciate you taking the time to distill all your research into one “broad strokes” post. Excellent stuff! There are some really good ones like LORE which are short stories every two weeks. Others are informal interviews which can go from 30 mins to an hour. Other story based ones like Astonishing Legends can be 4-5 hours long divided into many episodes. It’s a wonderful format – totally flexible. Excellent post, Ramsay! I agree with everything you said. I also use Audacity and blubrry and have been pleased with both. I use a Blue Snowball USB mic that I bought on amazon and love it. I do an interview-style podcast on my Ever Illuminated blog. To do that, I call on skype and use Pamela (www.pamela.biz), an inexpensive skype recorder. Pamela is fairly reliable, though sometimes I have to call twice to get it to record. Also, am having trouble recording on 2 channels, which can be problematic if the person I’m interviewing is recorded at too soft a volume. Another thing to mention is editing. To avoid editing nightmares, I tell the people I’m interviewing to pause and start over if they make a huge mistake or want to start over. Some people clap, but that could be startling if the person you are interviewing isn’t expecting it. With a clear signal, it’s much easier to edit out the mistakes. Editing a 40 minute podcast takes me about 2 hours. I remove long pauses and filler words (um, uh), if I can. Sometimes it isn’t natural to remove them, so I don’t always. And I don’t believe the podcast has to be absolutely perfect, so I don’t sweat it too much. If people are thinking of adding an intro and outro, best to do it from the beginning because your stats get all messed up if you re-upload a different version of a podcast. I recorded mine with some royalty-free music from premiumbeat.com. You can use intros and outros to ask people to sign up for your list, buy a product, whatever. Very useful. Great summary of how to start a podcast! The basics are definitely all here, although many new podcasters get lost in the technicalities, especially when trying to set up their feed, production, editing, knowing how to format a show, let alone understanding how not to fall foul of copyright law, and ultimately how to market their podcast to get more listeners! I’d definitely recommend starting your own podcast if you haven’t done so yet, it definitely sets you apart as a content creator, and brings you closer to your audience. Thanks Ramsay! Both the post and the comments are absolute gold. Yeah the comments here are amazing. Always better than the articles. I feel very lucky. Love this huge guide!!! My only alternate recommendation is Libsyn over BluBrry for hosting the RSS feed and submitting the podcast. There are a few reasons for this, but Libsyn has a lot of tools that Blubrry doesn’t, better analytics, and also if anything happens with your blog (crashing, site issues, not getting the show notes up right on time), you can still have your podcast live because it’s not tied to your blog directly. you can still embed the episodes into your show notes/blog posts, but after using both, I would highly recommend the switch. 🙂 But everyone has their own preference!! It’s nice to have choices. Wait, what’s the difference? Is there a Libsyn plugin now too? Great article. I enjoyed it. Audio Technica makes great audio gear, I have used their wireless and USB mics for years so that was a super recommendation to others. If anyone is going to start doing podcasts then you would be helping yourself a lot by doing some audio treatment of your room. Anything will help. Just do what you can afford. Agreed. Hope you threw out the mic cover that came with the microphone! If you use Blubrry Podcast Hosting you can post – upload – publish from within your WordPress dashboard. This allows you to focus on your content.. Controlling your RSS feed is critical so using Blubrry PowerPress Podcast plugin is key. I took a look and it’s a little bit more expensive than Libsyn but looks pretty solid. Reliable? Excellent post! I am completely agree with everything you said. Currently I am using Audacity and blubrry and have been pleased with both. As a radio producer I would like to chip in some thoughts relating to the actual content of any podcast. Many I listen to become boring because too little attention is paid to the creative style and approach. #1 Define your communications objective. #2 Design a format. ie Talking head (monologue), interviews, a wrap – where the presenter links between clips from other people, a spoof advertisement, a play, a vox-pop – etc etc. Or maybe a programme which includes all of above. #3 A script is not written it’s re-written. #4 A good voice-over artist will bring the script to life. #5 Mix in sound effects, music, fading up and down to facilitate a sense of flow between items. #6 No matter how many listen, present as if you’re talking to just one person. #7 Editing a 5 minute interview takes time, lot’s of it, unless you pre-plan what you want / need from that interview. So research good questions which will engender good answers. Ultimately you’re painting pictures with sound, so start with little sketches and build from there. Legendary comment! Thanks so much for pitching in. So much great information in your post and in the comments. I’m excited and daunted, and I can’t wait to get started. thanks. i have followed your blog for a while then left now here your podcast tutorial is rich in content, i am applying it for a client here in nigeria. I wanna know, If i will register my site with any host like hostgater or Bluehost than will I get its copyright automatically…?? I hope to try podcasting soon. Thank you for your in-depth post. Haha, you’re the king, the only one able to have his readers writing more than himself. Even with a 3000 words post! I don’t know yet if I will podcast one day, but I keep this precious article + its wonderful comments. I can say that you’ve got the readers you deserve! Brilliant like yourself. Oh man, this is so detailed and technical it easily makes the number one article covering this topic! I love how you describe literally EVERYTHING, and even add a video as well. Bookmarking this, if the time comes one day. 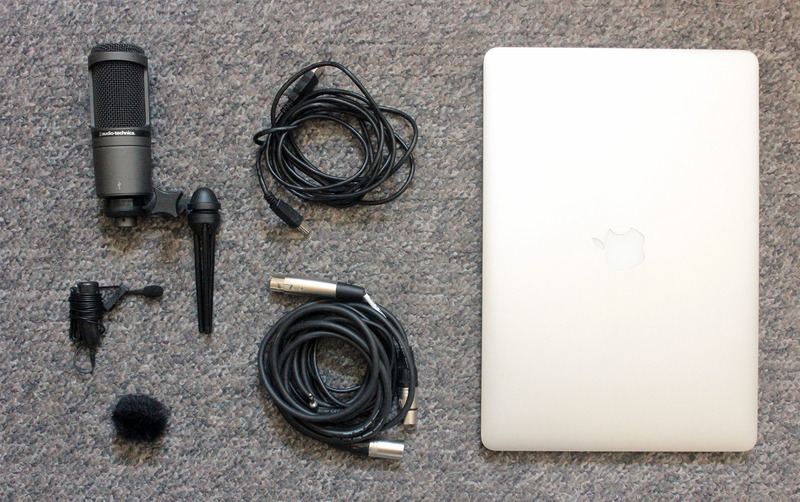 Few things to add… Podcasting is really that huge! Lots of people are starting a podcast where they previously had written content only. Even fiction is doing good- just look at the Night Vale. I personally, find longer podcasts to be sort of inconvenient. So maybe experimentation with length is the first thing I would look into. Oh, and it’s nice to add finality to it- say giving the episodes a certain theme so they form a season. Each season has a definite number of episodes. This can add structure, and resemble a sort of course- especially for informational podcasts like in the IM space. Once again man, cool article! Can’t believe someone got this so nicely and neatly explained. Oh, and for those of us struggling with the English accent… Would you say Fiver is an option? Already used it once for a very large video project, and narration was top notch and fairly cheap. Think that can work? Oh, and see the Bring it Minute with Tony Horton… The format is fantastic. One minute, he talks fast, a very professional intro, a lot of charisma… Think it’s off the air now though, but anyway, a cool way for people to start if they are afraid of the more traditional lengthier format. I’m not ready for a podcast at the moment. It feels overwhelming. I completed my first year of blogging recently and continue to have so many other goals to work on. Did anyone else feel that way in the beginning? This is such a helpful, well-researched post. Thanks for all the information, Ramsay. And I appreciate the helpful comments, also. I’ll be back to learn more details when the time comes! Great blog post. I started out with the Blue Yeti mic and it was exactly what i needed. Its about time to upgrade, i think, and im considering sticking with the Blue brand. Any suggestions on higher end models? Thanks Ramsay, just followed the steps you provided and submitted our first podcast episode to iTunes for review. After thinking and planning (and procrastinating) for a year and a half it was great – although nerve wracking to hit the submit button. Because our work takes us out in the field so much and I’ll be doing interviews on the run, we decided to use a couple of Rode SmartLav+ mics and an adapter and record straight onto my iPhone. So far the sound has come out pretty good although using this method only gives you one sound track to work with so if I have someone who speaks very quietly it will may be an issue, still the payoff is portability. Let me know when it goes live! Now live on iTunes, the Care Directions podcast. It’s primarily aimed at people working in the community care sectors. I submitted the podcast to iTunes and Stitcher, is there any other platforms I should submit to? Hi Ramsay, sorry to leave this message on the wrong post and not too sure on the best way to contact you? I signed up to your updates (which I love x x x ) which I received as and when you sent out an update. The other day, it dawned on me that I hadn’t received an email update for some time, in fact the last post I remember reading was your post https://www.blogtyrant.com/delete-email-subscribers/#more-10803. Just logged on and noticed a couple of updates since that post. Wondering if something is not working correctly or if you did delete a whole load of subscribers? I just checked and it says you’re subscribed and receiving. Did it possibly go to your spam folder? If not let me know and I’ll follow up with AWeber. Thanks! Just checked my spam folder and nothing there. Hi Joanne. I followed up with AWeber and they said that they can confirm that all the emails have been delivered successfully and suggested that perhaps it is an issue with iCloud settings as they have seen that before. Sorry I couldn’t be more help. Cheers. Hey Ramsay, i checked icloud and everything looked ok. Anyway what ever we did or didn’t do between us, it now seems to be working again. I have just received your latest post. Thanks for your help. A podcast is a great way to say something about yourself or about any business online. Post’s excellent.